How do strawberry plants reproduce themselves--learn about strawberry reproduction here. Among the many different species of strawberries, reproduction occurs both sexually and asexually. In addition, there are two forms of sexual reproduction: cross-pollination and self-pollination. 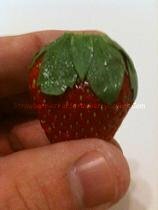 Strawberry plants reproduce asexually through their stolons, also known as "runners". As the stolons grow out across the ground, they periodically form structures called "nodes". These nodes will attempt to grow roots into the soil. If a rooting attempt is successful, a new plant crown will grow above the roots and a new daughter strawberry plant will be formed. Contrary to popular belief, some strawberry varieties rarely reproduce through stolons. For example, some varieties of F. vesca (the species most commonly known as the "wild strawberry") reproduce very little by stolons, relying instead on seeds. It is also worth noting that F. vesca has the largest home range of all wild species of strawberry plants (most of North and Central America; Europe; Asia; and northwestern South America). When strawberry plants reproduce asexually, the resulting daughter plants are clones of the original ("mother") plant. Thus, the daughter plants are genetically identical to each other and to the mother plant. This is extremely useful for agriculture, since it allows farmers and gardeners to choose plants that are known to do well in specific growing conditions. Because of this, most strawberry plants began to be commercially produced by allowing stolons to root, then transplanting the daughter plants. Today, new plants for commercial use are instead grown primarily from "clippings" of specific parts of strawberry plants. Nevertheless, the basic idea of maintaining plant predictability by producing and using clone daughter plants still applies. Strawberry plants are also able to reproduce by sexual reproduction. Depending on the particular species involved (and perhaps a number of environmental factors), strawberry plants may be hermaphroditic (i.e. having flowers with both the male stamens and female pistils) or distinctly gendered (i.e. the flowers of some plants having only the male stamens, and other plants having flowers with only the female pistils). Species can also have a mix of gendered and hermaphoditic plants. Strawberry species with distinct genders are "cross-pollinating", that is, each plant requires another plant of the opposite gender in order for the plants to reproduce. Hermaphroditic strawberry species may also be cross-pollinating, but are commonly "self-pollinating", that is, each plant's flowers have both male and female parts, thus allowing the plant to reproduce in isolation from other strawberry plants. Note that "self-pollinating" does not mean the plant can pollinate itself: the plant still requires a bee (or a human) to move pollen from the male to the female parts. Once the flowers of a strawberry plant are pollinated, the "berries" of a strawberry plant form and ripen. Actually, botanists (plant scientists) refer to strawberries as "pseudocarps", rather than "berries", because it is the "receptacle" of a strawberry plant, rather than the plant's ovaries, that ripens. The purpose of the ripened strawberries is to tempt animals into eating them, along with the attached seeds. As the animals move, these seeds pass through their digestive systems and are eliminated. This allows the strawberry species to spread to many new areas. As you can see, the answer to the question "How do strawberry plants reproduce?" is rather complicated and involved.